Kraft Dinner is simple, understated, and has some dedicated fans. It’s cheap, quite unhealthy to regularly eat it, and can be quite repetitive. Yet it’s loved for all these reasons. When a box of Kraft Dinner is torn open, an silent voice heard by all tells you exactly what you’re in for, a low quality, albeit delicious meal. It speaks to a certain lifestyle, an atmosphere that instantly comes to mind when the image of eating KD out of the pot is presented. A hazy, goofy feeling of nostalgia, of our lives when things were simpler (life only seems to go one direction in that respect, constantly complicating) or at least when things weren’t as they are now. Lo-fi hip hop is exactly the same, a simple, tasty morsel that appeals to a specific mood and emotional landscape. 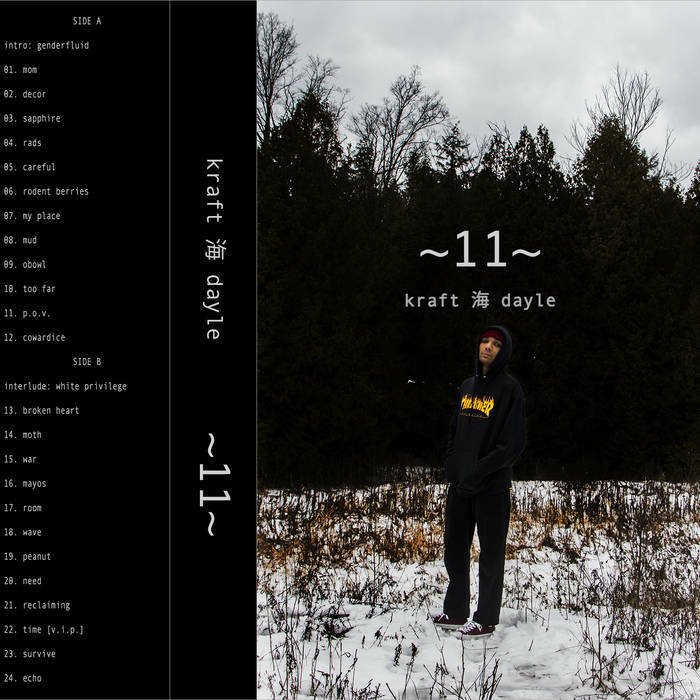 ~11~, a new project from Oshawa’s kraft 海 dayle, fits this mold perfectly with their fresh release. The formula on this album, like KD, is straightforward and loveable; take a 27 track tape, each one rarely running over ninety seconds, comprised of deep kicks, cracking fat snares, swinging hi hats, fuzzy melodies, A Tribe Called Quest and other anonymous vocal samples, throw in some interludes, and put a heavy compression over it all to bring out the low end in the sounds. This yields one bumping, self-aware tape full of political and personal weight. On this specific release, what you do get is an example of just how appealing and enjoyable this formula can be. I haven’t heard many beat tapes that have hooked me with the very first track. They’re far and few between, and dayle has definitely created one, opening with a quote about genderfluidity to give us an insight into their thoughts and life, and then immediately launching into “mom”, a standout beat, which starts off with a short piano loop followed by a heavy thumping bass drum just a few seconds in, setting the tone for an album of whimsical short beats full of colour and bright sounds. The constant references to Kraft Dinner throughout the tape reinforces a humorous examination of identity, and perhaps even a knowledge of the tapes existence as a perfect summary of the lo-fi hip-hop genre. What makes this tape stand out, aside from the amazing sampler beatcraft, is the personal connections and political statements that dayle has put into the liner notes, song titles, and interludes, infusing the tracks with these thoughts. It accentuates this release as a deeply emotional soundtrack for their lives. It gives the listener a different perspective to know that these positive, groovy beats were spawned out of a love and passion for dayle’s life and the people in it. ~11~ is a low-fidelity, half-serious take on serious issues. Its creative use of loops and snares, kicks and hi hats all come together perfectly in each beat, and while all the tracks are quite similar upon first listen, eventually the nuances of each one comes through, whether that be from the differing patterns of syncopation, or the unique melody phrases. Sometimes we all need a reminder that life is, after all, not so bad, despite all the problems we might face. And this tape is exactly that.